Designed and manufactured in Germany, the MK 8 features a sturdy metal housing and an elastically mounted capsule to reduce structure-borne noise. 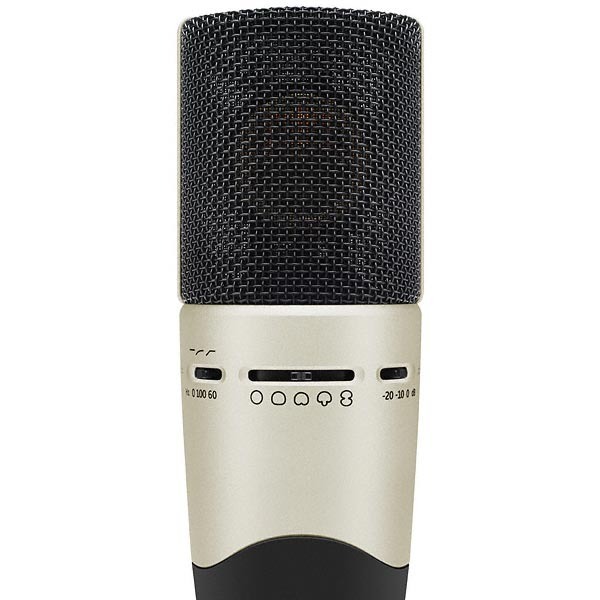 The microphone's dual one-inch diaphragm offers five selectable polar patters (omni-directional, wide cardioid, cardioid, super-cardioid, and figure-eight) for versatility in the studio. A three-position filter (off, 60Hz, and 100Hz) allows users to cut low-frequency rumble below 60Hz, or to introduce a softer roll-off at 100Hz to compensate for proximity effect. The MK 8 is also fitted with a three-position switchable pad (off, -10dB, -20dB) to protect against louder sound sources. The MK8 ships with a microphone clip and protective pouch. An optional elastic suspension, the MKS 4, is available separately.